Going into this movie I knew little about A Princess of Mars written by Norman Bean aka Edgar Rice Burroughs, besides a few pictures from Frank Frazetta and possibly even Frank Cho. 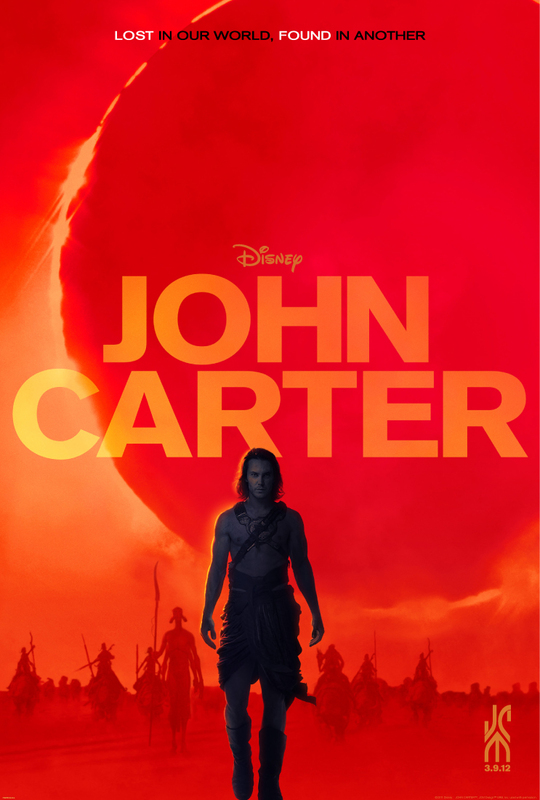 What I do know about the movie, John Carter is the trailers weren’t that good until recently and after seeing the movie, I can understand why Disney had not a clue how to market this movie. John Carter, played by Taylor Kitsch is a Civil War Veteran trying to find the elusive cave of gold when Uncle Sam drafts him to defend their outpost in the Arizona Territories. After butting heads littering and figuratively with the dear Captain Powell played by Brian Cranston, John does what any self respecting person would do, he steals the Captain’s horse and makes a run for it. He doesn’t get very far and after running afoul of some native Americans, he manages to find his elusive cave of gold only to be teleported off Earth and into a strange place called Barsoom, aka Mars. The beginning scenes of Carter’s adventure are quite interesting since the gravity on Mars is lighter and he can jump over tall buildings ala Superman. The introduction of the Thrak, green skinned, four armed aliens, is a fun experience and with the likes of William Defoe, Thomas Haden Church, Samantha Morton they help give some warmth to the CGI characters. Barsoom besides being populated by the Thrak also has two remaining cities of what could have been a thriving populace, one moving, Zodanga and one stationary, Helium, both filled with humans. Dejah Thoris, played by Lynn Collins has found a way to solve the problems of her people but the puppet masters behind the scenes, the Thern, led by Metai Shang played by Mark Strong have bigger plans that do not include her. The Thern have given the same weapon Dejah has discovered to a Zondanga Captain, Sab Thang played by Dominic West that will turn the tide and in doing so forces Dejah Thoris’s father to marry his daughter to cease hostilities. At least until Dejah makes other plans and falls into John Carter. Overall, the movie has something in it for everyone, the romance between strong willed Throis and Carter, the mystery of the Therns and action adventure at enough points in the movie to move the plot along. As for why the trailers missed the mark until recently, I’m going to blame the fact the CGI wasn’t ready and just go with that. Even if many of the recent science fiction movies have taken elements from Princess of Mars, I found the story to be enjoyable once it slowed down and stopped throw out names we could not pronounce. At least Dune had some names we would remember or even pronounce but the names of these characters are just tongue twisters. A few reviewers have complained about the dialogue in spaces but the same can be said about Star Wars at times. Often you take the good with the bad, but the dialogue wasn’t as stilted as some might say. The bookends of the movie do allow for sequels but personally I’d rather see either a cartoon or CGI spin off ala Transformers/Clone Wars, I think designs of the airships would lend themselves quite easily to a cartoon. If Airbender/Clone Wars can produce a quality show then I think John Carter of Mars would be a great 22min show. This entry was posted in Movies, Reviews by RK Bentley. Bookmark the permalink. Next → Next post: [Viral Spoilers] And, how is Alex Kingston not in this video?